A major goal of population enhancement efforts includes ensuring that recovering coral populations are genetically diverse. Obtaining genetic individuals and tracking the genotypes of corals in nurseries and during outplanting is important for the long-term success of restoration efforts and the coral populations being restored. This is especially important for coral species that are endangered or low in abundance because they have likely already undergone genetic bottleneck where dramatic losses of coral colonies has reduced a lot of genetic material (called ‘founder effects’). 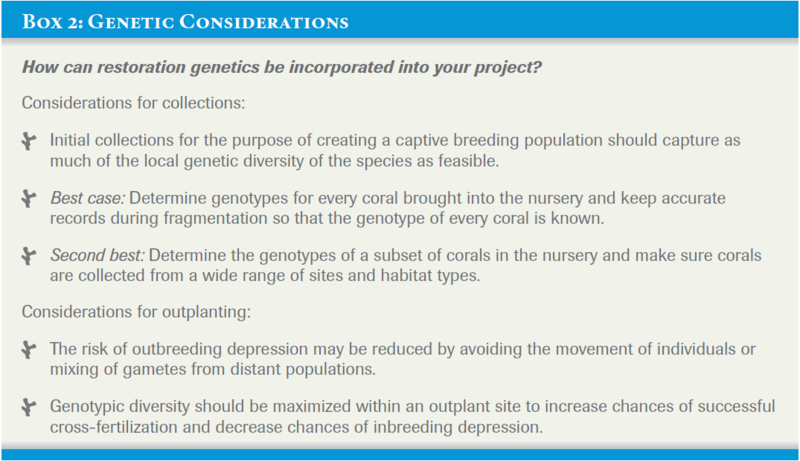 Thus, several resources have been developed to help coral restoration practitioners build increase genetic diversity in their cultured and outplanted corals. The genetic component of restoration should always be taken into account during coral gardening activities because population enhancement methods take advantage of asexual fragmentation, creating many colonies that are genetically identical (e.g., clones). If little genetic diversity is available during spawning for sexual reproduction, the population is at risk for inbreeding or other genetic risks that lead to reduced coral health and fitness. The artificial addition of selected genotypes can also diminish the overall genetic diversity of the wild population that is being restored. Coral nurseries also may pose a risk for genetic diversity by exposing corals to a novel or controlled environment with conditions that may not be optimal for all genotypes kept in the nursery. Thus, these conditions could artificially select for certain genetic traits, resulting in the overuse of a subset of genotypes that do well in nurseries. Coral gardening practitioners should aim to culture and outplant as many genotypes as possible. In collecting corals, nursery operators should aim to collect fragments from as many physically separated reef areas as possible to increase the likelihood of obtaining unique genotypes for propagation efforts. A number of genetic methods also exist to help practitioners determine if the corals in their nurseries are different genotypes, as well as measure genetic diversity, genetic population structure, inbreeding, outbreeding, and founder effects. These include microsatellite markers and single nucleotide polymorphisms (SNPs). If few colonies are available to populate your nursery, it is not suggested to use genetically depauperate coral fragments, which can lead to further reduced genetic diversity due to high selectivity in nurseries. Rather than moving coral colonies from further coral reef sites, it is advised that practitioners move coral gametes across large distances, and undergo the process of rearing corals from the larval stage as they will likely have better survivorship. Again, for gametes that are collected, breeding different genotypes is important for restoration to reduce inbreeding depression and outbreeding depression. Practitioners should continue propagating a range of coral genotypes regardless of a whether a genotype displays high or low productivity within nurseries. For instance, performance of a coral genotype within a nursery does not always predict its performance when outplanted, and genotypes may have widely different growth rates depending on environmental conditions. ref Because of natural ecological trade-offs in resource use, slower-growing genotypes may be more resistant to disturbances such as warm temperatures. Thus, practitioners should not disregard genotypes that rank below other genotypes or overall program benchmarks of survivorship and growth. To determine how different genotypes fair in different conditions, it’s advised that practitioners track all genotypes in nurseries and after outplanting, as well as during different environmental conditions. In outplanting, practitioners should outplant nursery-reared corals in similar geographic and environmental conditions to ensure maximum survivorship and fitness. Outplanting a number of different genotypes in close proximity will increase the chances of successful sexual reproduction and larval settlement that will help achieve the site-wide genotypic diversity.